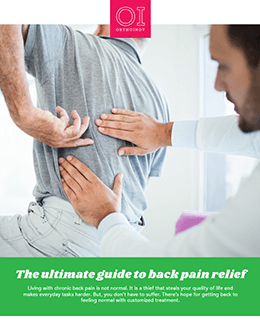 Back pain is one of the most common reasons people seek the care of a physician or miss work. There are many causes and symptoms, but most times pain in your back can be treated without surgery. You should see a physician if your pain has not improved with rest, usually within two weeks. You should seek immediate care if your pain is accompanied by a fever, bowel problems, pain extending into your legs or is causing you weakness, numbness or tingling in one or both of your legs. Immediate care may also be necessary if you have recently fallen, experienced a blow to your back or other injury. To determine what is causing your pain, your physician will ask you for a complete medical history, have you describe your symptoms and conduct a physical examination. Imaging tests are usually necessary to confirm the diagnosis. If your pain is caused by a chronic condition, surgery may be necessary and depends on your diagnosis. Motion, exercise and stretching is important to strengthen your back and prevent injury. Correct posture when sitting and correct movement when lifting is also important. It is also important to maintain a healthy weight.